Brightpaw puffed up his chest and padded over to Echostorm. Firepaw growled and padded over to Willowdaisy. Ivypaw wiggled a little, then padded over to Webalder. Sandpaw bounced over to Blackstripe, waving his tail in the air. Smallpaw puffed out his chest and padded over to Volerabbit. "Let's go check out the territory." 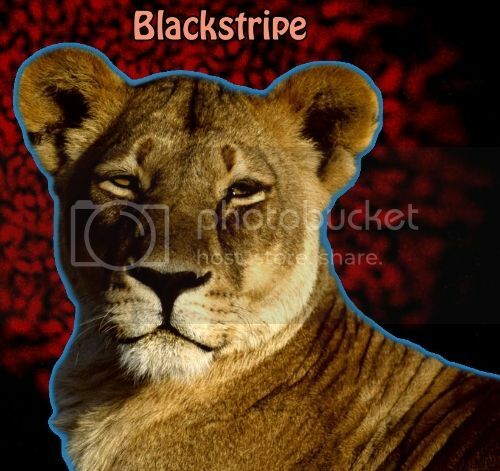 Blackstripe suggested to Sandpaw. "Ready to learn how to hunt?" asked Echostorm as he touched noses with Brightpaw. "Let's go work on some fighting moves." Volerabbit suggested to Smallpaw. "Mind if we come with you?" called out Webalder to Blackstripe. "Go get to know your new denmates." suggested Willowdaisy to Firepaw. "Firepaw, Sandpaw, Brightpaw, Smallpaw, Ivypaw!" cheered Coyotefeather for the pride's newest apprentices. Clovestripe pulled a chimp from the fresh-kill pile and sat down nearby to eat. Coyotefeather padded into the FlamePride camp, carrying catmint in her jaws. She made her way into her den, placing the catmint into the storage. "Let all lions old enough to catch their own prey gather for a pride meeting!" roared Tornstar from the center of the pride camp. Dustpaw pricked up her ears and padded over to hear what Tornstar had to say. "Bumblefall, is it your wish to give up the name of warrior and go to join the elders?" called out Tornstar once the pride had gathered. "I call upon StarPride to give you many seasons of rest. Your pride thanks you for your service." finished Tornstar. "Bumblefall, Bumblefall, Bumblefall!" cheered Firepaw for the pride's newest elder. Coyotefeather padded out of her den, dragging the body of Willowdaisy in her jaws. She made her way into the center of the pride camp, placing the deputy's body so the pride could grieve. Echostorm padded forward and pressed his nose into Willowdaisy's fur. Tornstar touched his nose to Willowdaisy's fur, then tossed his head back in a roar. "Lions of FlamePride. Listen, And I will appoint the new deputy. I say these words before StarPride so our ancestors may hear and approve my choice...Nightflower will be the deputy of FlamePride!" "Thank you, Tornstar." answered Nightflower with a dip of her head. "Nightflower, Nightflower, Nightflower!" cheered Onepaw for the pride's new deputy. Coyotefeather padded out of her den, carrying the body of Petalfur in her jaws. She made her way to the pride burial grounds, placing the elder in a hole and covering her body with earth.